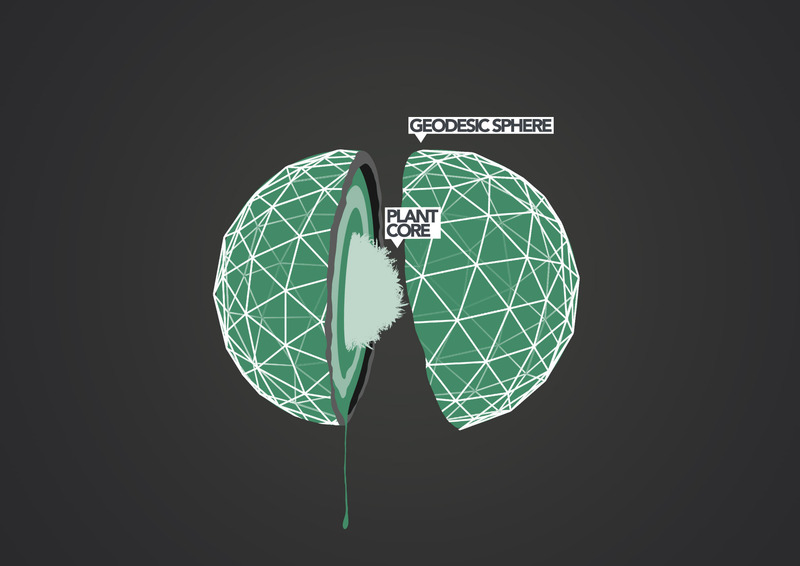 This post shares the narrative behind the development of the reEarth project as an agenda, technical investigation, art project, and speculative architectural proposal. First to give you a summary of the processes here’s the making of film. Largely architecture is understood as static. Buildings do not conform to nature, its environment and nor to human beings. We as architects feel the need to integrate plants in buildings to the point where people think of them as actual living systems. Therefore, our general theme and approach in this set of projects is that plants should become part of our society as well as self-reliant, and be given the ability to autonomously interact and walk with us. Since the beginning of human kind, men have positioned themselves in front of nature and natural resources. This first prototype plays with the notion that in order to access its energy, men must learn how to respectfully interact with nature – in the order SUN/GREEN/MAN. The prototype is seen as a larger scale architectural improvement. With the reduction of gardens as years pass on, the design represents a depleted Earth as it is regenerating and given new life. Earth Rebirth is the continuation and enlargement of the previous prototype. The design proposes an egocentric suspended kinetic-garden that deforms and opens up to reveal a source of light inside its core. 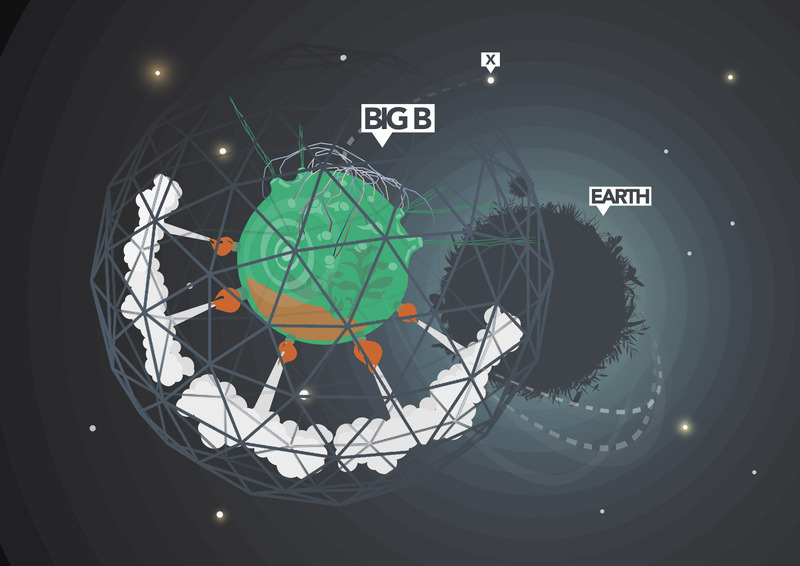 The video illustrates the interactivity of Earth Rebirth – opening and deforming by the movements of the strings attached to the dancer’s body. The video illustrates the interactivity of Earth Rebirth – opening and deforming by the movements of the strings attached to the dancer’s body. Re-Earth is the first of a string of projects that starts making use of plant electrophysiology. Plants have no nervous system but use electricity to transmit signals as all living things do. In this project, a surface contact electrode was used to measure the signals, a signal amplifier to convert them into readable measurements, and they were ultimately mapped to frequencies in order to create a voice for the plant. The structure, acting as a greenhouse, has its outer cover opening and closing according to the plant voltage changes. The second part of the project was to convert the voltage changes from the plant into movement by inflatable silicone modules. 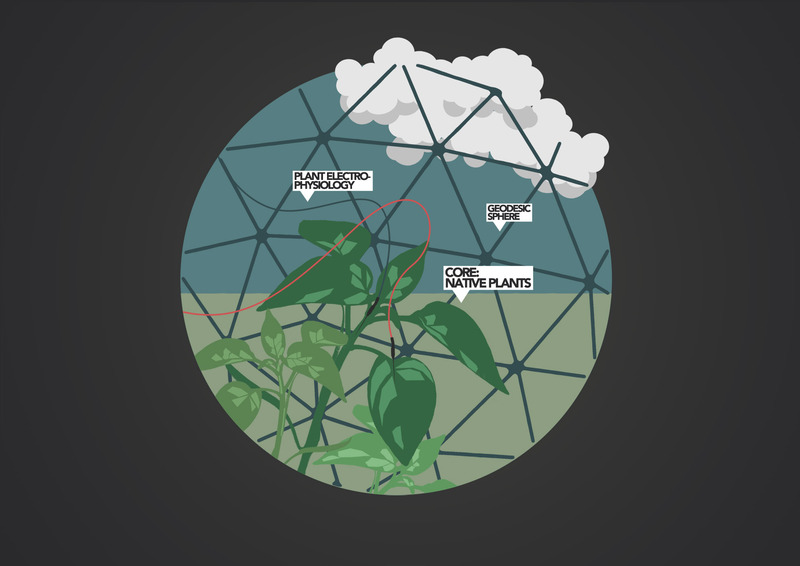 The Green Law is a network with two interfaces – a cyber-gardener and a plant. The plant senses the environmental conditions (light, vibrations, temperature, humidity) it is situated in, and messages the gardener about them. Automatically, the system calculates whether that particular environment is suitable for the plant or not. If not, the cyber-gardener will ask the plant to transfer to a new environment. It is then up to human interaction, for the plant to move accordingly. 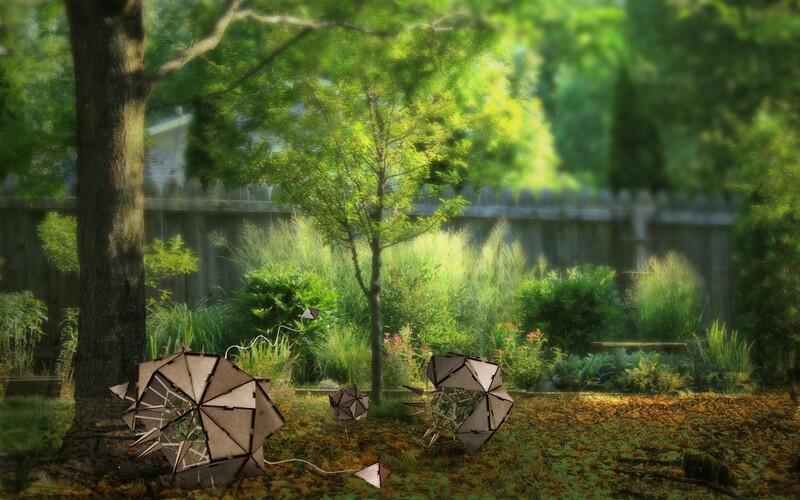 This proposal is a micro-climate in a stellated icosahedron, representing a seed. Electrophysiological measurements determine whether the plant is in a good condition, and environmental sensors in the legs regulate where it should position itself. The soft tissue membranes on the legs open up to create shading when needed. They also elongate themselves to seek out new conditions. Seasonally, the plant will produce seeds. They fall in the inner core while it is rotating and when it deems necessary, the plant will release the seeds through its legs, while stepping on them. The image below illustrates three Seeds rolling in a backyard. The detached environmental sensors measure the external conditions while informing the plant of a potential suitable location. Following the Seed proposal, the shape now changes to a geodesic sphere, in a way that each of the hexagons and pentagons extend to become pyramids, so that the pentagonal ones take the role of the legs that make the structure roll, while the hexagonals act as shading devices and environmental sensors. Electrophysiological signals are measured from the plant and the sensors direct the structure accordingly. The sectional model shown below displays one of the actuators (legs) of Re-Earth. The pentagonal pyramid extends and retracts to make the sphere roll. Native english plant, plant no longer present in the wild. Electrophysiological measurements setup and readings on screen. 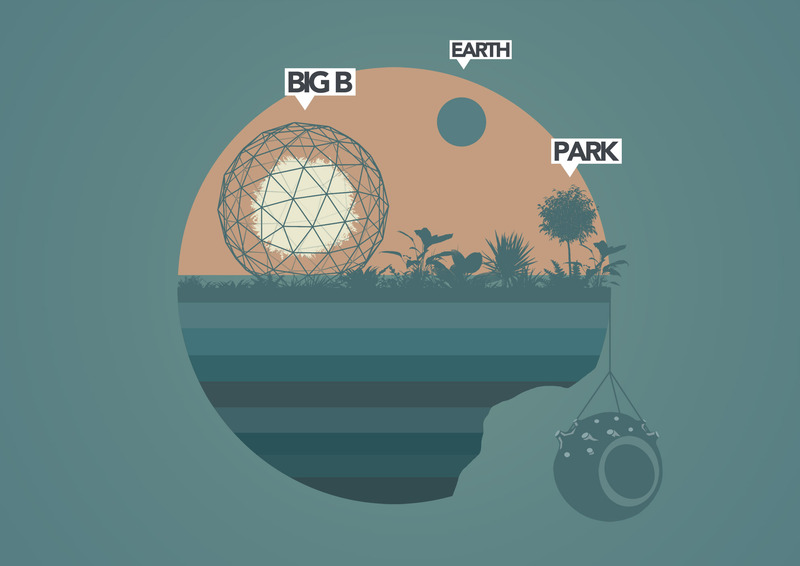 Following the construction of the geodesic sphere, the plant is now imagined as the driver of Big B, with the purpose of integrating in society, by being self-reliant. Bigger scale requires a bigger actuation system. The advantage of the coming one is that it could scale up according to the weight. 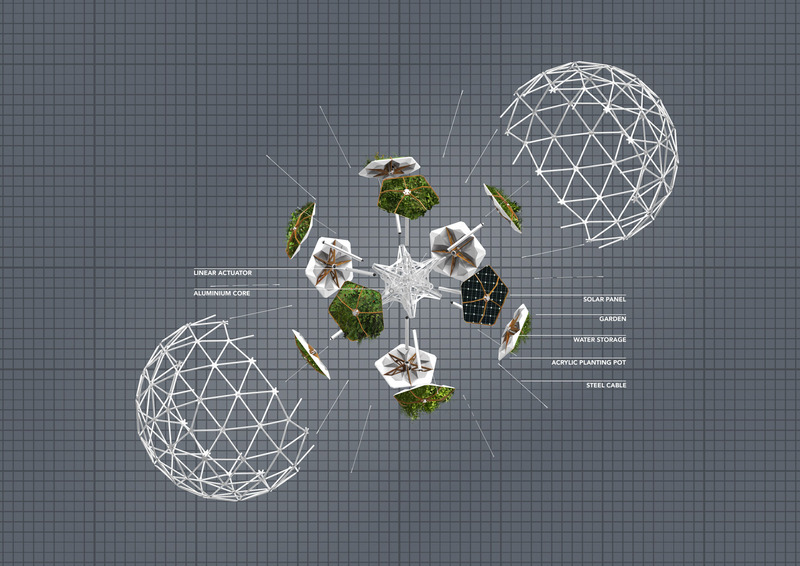 In this proposal, the 3 metre geodesic sphere has a robotic core that drives the structure, followed by plants held by a mesh and shading devices (inside the sphere) that extend to detect changes in environmental conditions. People interacting with BigB in Victoria Park. 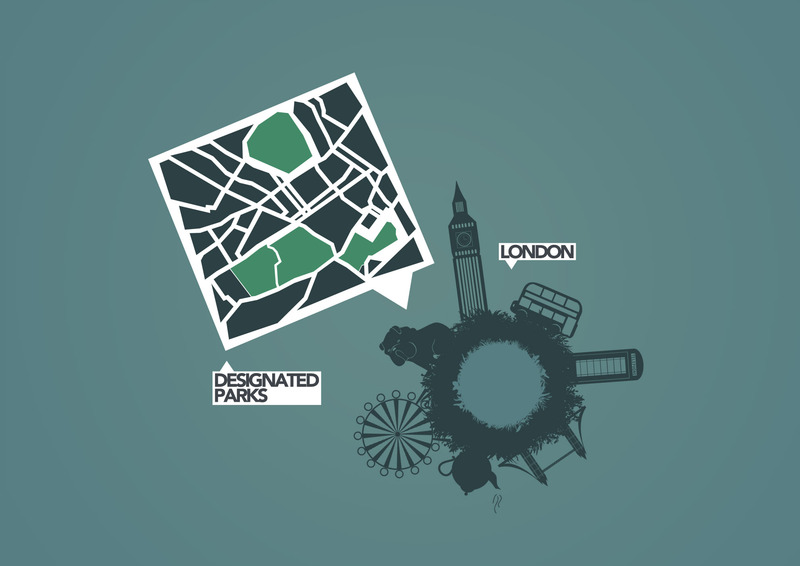 At present, there is a general acceptance that we are shifting towards a greener London, with designated areas for nature. However, the London Natural History Society states that much of Greater London is now inhabited and dominated by non-native plants. As these often tend to be invasive, their communities spread while many of the native plants are becoming increasingly threatened. 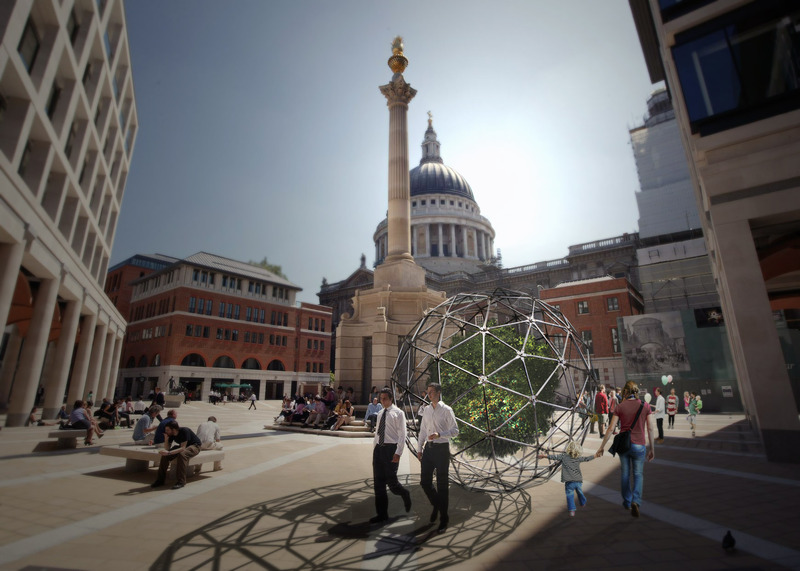 The proposal thus sees itself as an extension to a park, a vessel with native plants situated inside a geodesic sphere that travels through unknown land: the urban London. The exoskeleton (geodesic sphere) is driven consequent to electrophysiological data as the plants are imagined to be the intelligence of the structure, with the purpose of reprocreating themselves. 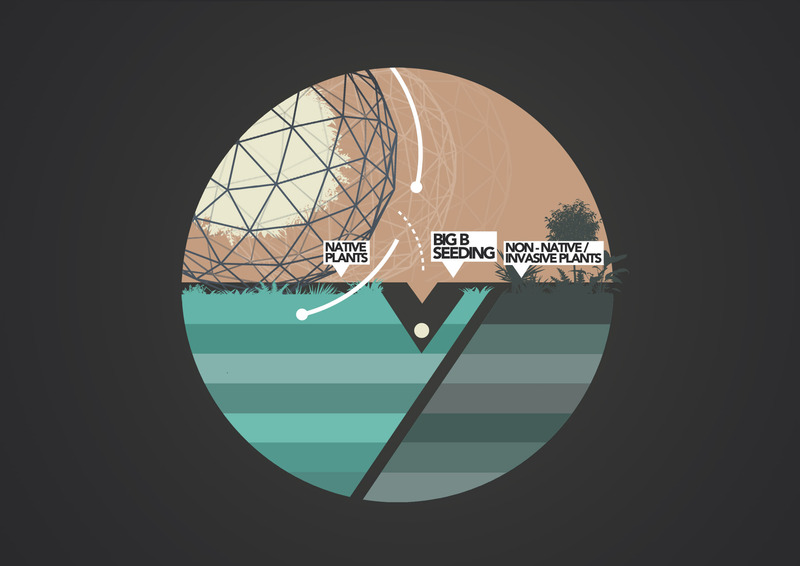 Upon signal receipt of a daylight transition, the augmented plants act by informing the system about the gardens’ needs. The corresponding module then expands out by means of a linear actuator to act as a weight shifter. 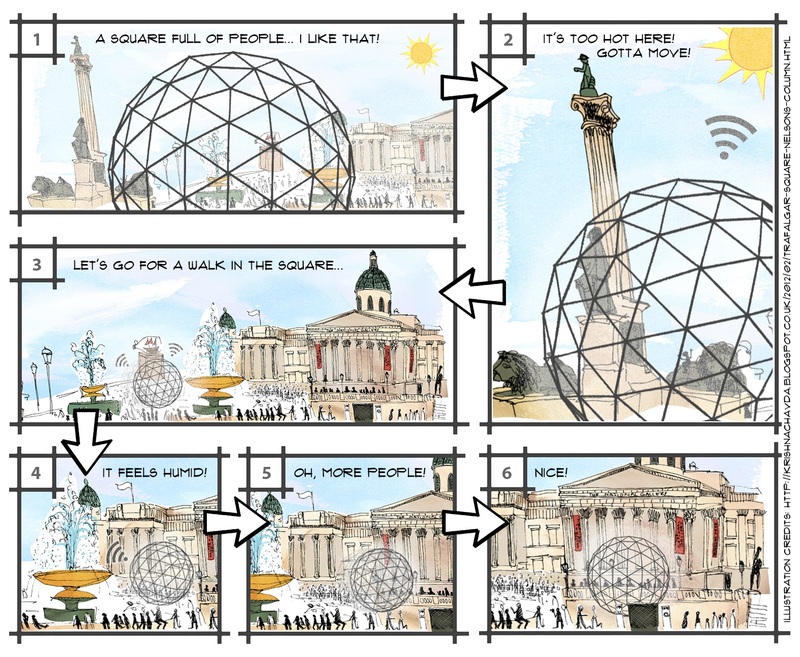 Consequently, the sphere rolls so that the shaded/sun lit faces of the gardens are interchanged. Alternatively, through a series of sensors that seek out new external conditions, the plants’ architecture searches for new spots of sun, until a potential location is acquired. Fuller, R. B. (1969). Operating Manual for Spaceship Earth. Book. Beesley, P. and Armstrong R. (2011), Soil And Protoplasm – The Hylozoic Ground Project. 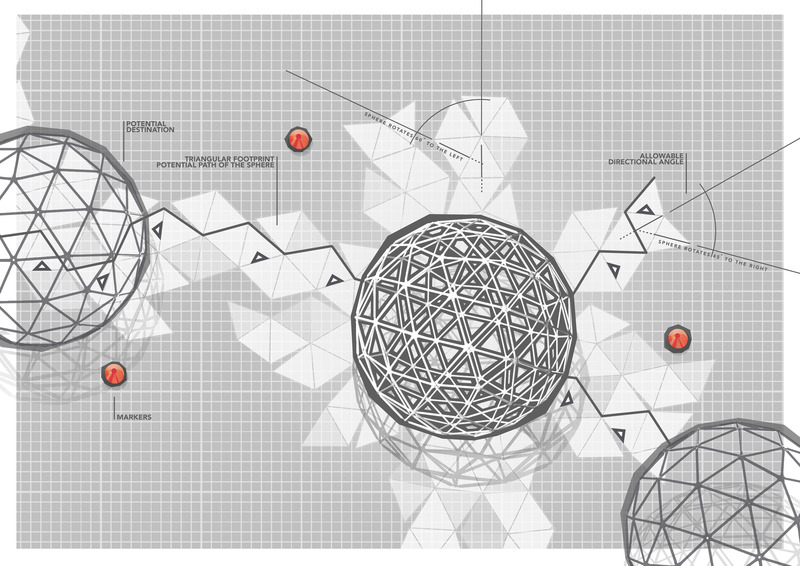 Architectural Design Magazine, John Wiley & Sons Ltd.
Spiller, N. and Armstrong R. (2011), Protocell Architecture. Architectural Design Magazine, John Wiley & Sons Ltd.
Stokes, A., Shepherd, R., Morin, S., Ilievski, F. and Whitesides, G. (2013), A Hybrid Combining Hard and Soft Robots: 70-74. doi:10.1089/soro.2013.0002.